In Kidsty Pike we made sausages today! Dave showed us how to chop the meat up into pieces. We put the meat into the mincer and it chopped it up into little pieces that Billy said looked like a worm! We used our hands to mix the meat with black pepper and herbs, Kayla thought it was gooey! We put a little bit of a skin onto the pipe of the sausage machine, Oscar said that they then put the sausage mix into the skin by winding the handle of the sausage machine forwards. Mack said if you wound the handle fast, the meat would come out fast - but we wound it too fast, and Willow said it burst like a balloon! Jai enjoyed wrapping the sausages in bacon to make Pigs in Blankets! Amber liked making a HUGE long sausage like a spiral called a Cumberland Sausage! 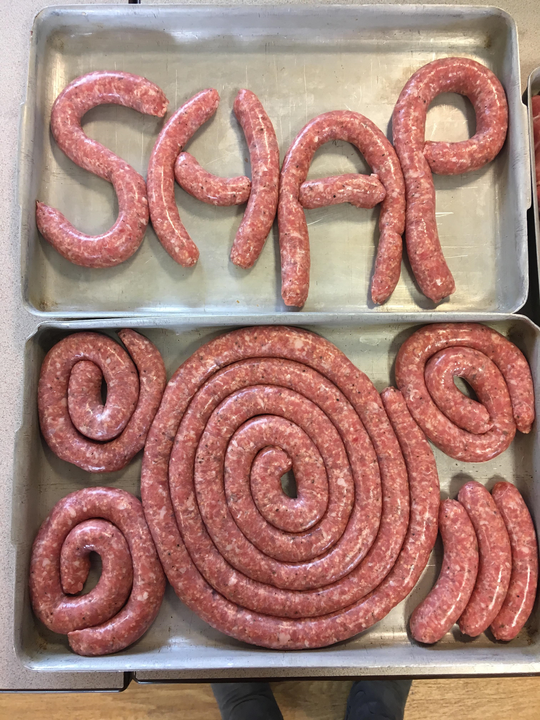 Arthur was pleased to make a sausage that was the word 'SHAP'!